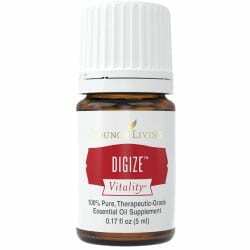 DiGize Dietary Vitality Blend is one of our most unique essential oil blends, combining Tarragon, Ginger, Peppermint, Juniper, Lemongrass, Anise, and Patchouli oils for a spicy, exotic aromatic blend. DiGize oil also includes Fennel essential oil, the use of which dates back to ancient Egypt. DiGize Dietary Vitality Blend may help you enjoy each and every meal! This proprietary blend of Young Living essential oils is a great mealtime companion and addition to your wellness regimen. DiGize Vitality blends Tarragon, Ginger, Peppermint, Juniper, Fennel, Lemongrass, Anise, and Patchouli essential oils for a fresh-tasting blend—a perfect follow-up to any meal. Some cultures munch on fennel seeds after meals, and the use of this potent plant even dates back to ancient Egypt. Experience the power of Fennel Vitality and these other essential oils for yourself! Dorado Azul Essential Oil, 5 ml.